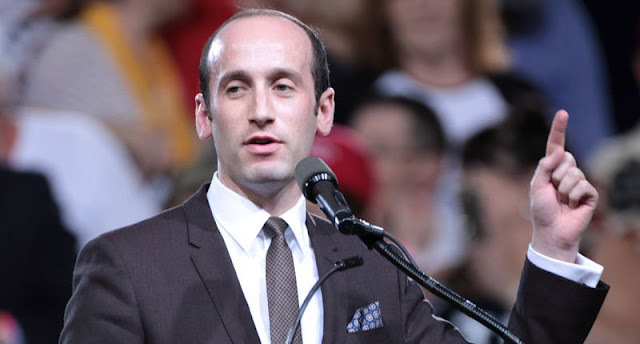 Stephen Miller speaking with supporters of Donald Trump at a rally at Veterans Memorial Coliseum at the Arizona State Fairgrounds in Phoenix, Arizona. To state the obvious, this is just another run-of-the-mill, catastrophic trump-card cult, people playing god for self-love and/or money. There’s no GOP anymore. Let’s stop calling it that. It’s the TMP which stands for Trump, temptation, and trump-cards. The temptation of trump cards is what all cults have ever been about, those fake get-out-of-fail-free cards cults offer to tempt supporters ¬– cards that enable supporters to launch into a long pathological fantasies of being as gods themselves – omniscient, omnipotent and omni-pious – infallible, invincible and unassailable, know-it-alls, win-it-alls, and holier than absolutely everyone. Trump-card cults are not just bubbles, they’re rolling fortress encircled by trump-card landmines, crushing and detonating everything in their way. They roll by means of a vicious circle of self-delusion. Omnipotent: …so we deserve to be invincible using any scam, cheat, or devious ploy ever discovered to win. Omniscient and omni-pious: …Our winning proves that we’re omniscient and omni-pious. What a trump-card cult stands for means nothing. They come in all disguises – conservativized, Liberalized, Communized, Libertarianized, Anarchized, Muslimized, Christianized, Athiestized, nationalized, racialized, genderized, moralized, mindfulized trump card cults – always issuing the same generic trump cards and tempting that same human eagerness to play God. None of these trump-card cults ever even test their ideologies in practice. It’s never about ideology. Communism was never tried, nor will libertarianism ever be, because that’s not what the cults are about. It’s always just that same idiotic heady self-deification fantasy playing itself out, ending in ruin. Their ideologies are their disguises. The TMP cult is common, typical, dime-a-dozen, generic. We should have seen it coming. We should have better antibodies against the same damned thing. Instead, we treat each as unique falling for their self-branding, as though a communist, fascist, nationalist, anarchist, Christian, Muslim, or any other coup is anything but just another trump-card cult. Buying into their rationalizing branding just enables them. Communism and Libertarian are both just generic trump-card cults, but because we brand them as distinct, libertarians get to pretend that they’re a god-like crusade against the evils of communism. Such branding breeds counter-cult wars, both sides fighting for self-deification. World history is strewn with tyrannical overthrows like the one the TMP cult is staging. They always yield the same catastrophes – massacres, genocides, wars, decline for decades and then, to recover, decades more. Being anti-war isn’t enough to prevent it. The founders knew to look to the source, trump-card cults. The founding fathers framed our constitution to prevent just this kind of trump-card cult coup, tyrants pretending to be God, and their god-grubbing cronies and followers. The framers installed well-greased turrets armed to defend our country on all sides, left, right, from the high and mighty spiritual to the lowly philosophical. Our constitution’s framing – rule of law, checks and balances – is the only reason the US was ever a beacon, a unique opportunity for a new world. This cult’s coup is moving at coup-speed and we’re reacting at the political snail’s pace of two decades ago. We’re not keeping up. It shows in our unintentional normalization, the ways that through our civic loyalty, sluggish reflexes, squeamishness or atrophied civil defenses we enable these god-playing locusts to devour America’s norms and institutions in these few hot summer days. Keep fresh our awareness that it’s the TMP coup, just another trump-card cult. Get the hell out of the practice of regarding it as anything but. Assert that that’s it’s just another trump-card cult is as little as possible. Don’t continue to make the case for something this obvious. Assume it. The burden of proof should now be on those who don’t see it that way. Don’t be distracted by their arguments that you’re over-reacting. You’re not. You’ve placed your bet, now stick with it. You could be wrong, but as guesses go, this is an easy one to get right. If it struts and commands like a trump-card cult it’s just another trump-card cult. Strip away all of yesterday’s habits of description. Not the GOP. Not its leaders, policies, supporters but cult leaders, cult covers and cult members. Not the culture wars, but a war against cults. Drop the subtleties. This is not a subtle situation. Our fine-tuned deliberations enable their trump-card cult. Stop moping in awe, surprise, shock, despair, and outrage. The cult loves it when you act so predictably. Stop cycling the news cycle as though pouring over clues for what they’re really up to. You already know. Cycling like that is a sign of your impotence, evidence that you can’t afford to draw the obvious conclusion because you don’t know what to do about it. Find something to do about it given that it’s just another trump-card coup. Stop debating whether they’re dumb, or shrewd, evil or naïve. Stop saying “Can you believe this! ?” Believe it because it’s happening. You wouldn’t react like that to a fire. This is a fire. Obviously. Stop saying “I can’t stand it.” It’s your home. Stand up for it or lose it. Stop mourning your front burner issue being back-burnered. It’s back-burnered. Stopping this trump-card cult has been shoved to the front burner. Focus on it. Stop touting your old pet opinions for likes. If you aren’t thinking new thoughts, be quiet, think, wonder, stretch and listen. Your old thoughts aren’t going to be enough. Think it up a notch or two. Stop hamstringing yourself with doubts about whether you’re sufficiently receptive, considerate, compassionate, or kind. Would you have such worries if someone pointed a gun at your babies? No, you’d snarl, claws out like a grizzly. But you’re not a grizzly. You’re smarter, more enterprising, more strategic. Wipe away those tears of mourning and disbelief, admit the obvious and start strategizing with calm fierceness about how to stop it. Don’t fight their trump-card cult with yours. Undermine all trump-card cults. Grease your turret as the founding fathers did. Trump-card cults are designed to appear infallible, invulnerable and unassailable. They’re armored and land-mined by design. The way to undermine them is to assume that’s what they are, talking and acting as though it’s obvious. That’s their Achille’s heel: When they go low, you go meta, taking the overview, exposing their trump-card cult MO. They can only retaliate with more trump cards. That proves your point. They’re one trick-phonies. Make that point over and over. “As predictable as clockwork. A diverse ways of saying “I know you are but what am I?” pretending they’re above it all by playing prude puritanical god police.” Be strategically reckless and relentless, firm in your interpretation that this is just another trump-card cult. Don’t ever let them lead you around by the nose. Control the debate and bait them every chance you get. Shame and outwit them as only a non-cult member can. Never talk morality policy or politics with cult members. They never cared about it as anything more than a way to distract you, a misdirection ploy in their campaign to self-deify. Stand your ground with calm confidence. During any of these common trump-card cult coups, anyone conservative gets labeled a radical. You’re now a conservative in the spirit of our founding fathers, trying to maintain order, rule of law and checks and balances in the face of just another trump card cult’s insane fantasy fling with self-deification.